FP1 is able to select pulses at up to 1 kHz rate. In setup with pMaster 4.0 generator can be used for pulse picking from max 20 MHz repetition rate pulse train. pMaster features 4 independent programmable channel outputs and communication via USB port with LabView compatible drivers for full control over all parameters. FP1-DKDP unit has DKDP crystal Pockels cell however on special request it can be changed to BBO or KTP Pockels cell. 1 - requires only 24V, 15W external power supply. 2 - VCR - contrast ratio when voltage is applied to the cell. 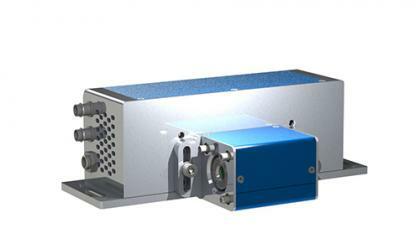 3 - other particular laser wavelengths or wavelength ranges are available on request. Pulse picker FP1 consists of built-in driver with HV power supply and a Pockels cell attached to the unit. This unit is able to select pulses at up to 1 kHz rate. FP1 requires sync pulses from the laser for driver control or can be used with pMaster 4.0 generator. Standard FP1 pulse picker has a DKDP Pockels cell and is set for quarter wave voltage operation. On special requests DKDP cell can be changed to BBO or KTP Pockels cell for half wave voltage operation. For synchronization of your laser with Pockels cell driver and triggering of Pockels cell driver used for pulse picking from the train of picosecond or femtosecond pulses we recommend to use FP1 Pulse picker in setup with pMaster 4.0 digital synchronization and delay pulse generator.